Some instructors place textbooks and other materials on reserve for students to use in the library. These items are located at the library’s Circulation (Checkout) Desk. Students need their NOVA ID to check reserve items out. Most reserve items are for IN LIBRARY USE ONLY. Some items are available for short-term lending (one, three or seven days). How can I find out if my textbook is available in Course Reserves? On the Books & eBooks tab, under the search box, click on Advanced Search. On the Search for menu, click on the button next to Course Reserves. 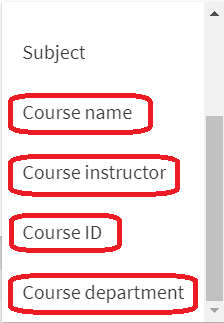 To search by individual fields in the course reserve record, click on the Any field drop down menu. Scroll to the bottom of the menu. On the list of results, click on the title of an item or the Available at link for more information. Why isn’t my textbook available on reserve? The library does not have textbooks for all NOVA classes. Reserve items are supplied or donated by instructors and academic departments. If your textbook is not currently offered, please talk with your instructor. Please note: Textbooks are often unique to each campus, which means, for example, that Alexandria textbooks would not be available at other campus libraries. If you have questions about course reserve items, please contact a campus library. A NOVA ID card is required to borrow any course reserve item(s). Course reserves cannot be renewed. There is a $4 per hour/day fine for overdue reserve items (as applies). Please check with your campus library to determine if there is a time restriction on In Library Use Only items.